In your place of work, if you are required to lift anything heavy or bulky, you should be provided with proper training before undergoing any form of manual labour. This will help you to work effectively but it will also greatly reduce the likelihood of being injured. Most firms undertake this form of training because they are required to or because they state that they look after their employees but anything which can help minimise the likelihood of an employee being injured and potentially missing work makes sense for a business. This means you should be focused on lifting boxes and items at work but you should take care to lift in the proper manner when you are at home as well. This is very much the case when you are moving home. With packing, lifting and unpacking you will be carrying out a lot of physical exercise and movements around the home and it is important you know what you are doing. If you don’t take the time to learn how to life boxes properly, you may find yourself at risk of pulling a muscle or causing yourself a serious injury. 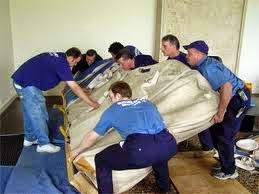 Sometimes it is best to call in the professionals for major moving work. There is an obvious benefit in calling in professionals in that it will help you to complete the job quicker and more effectively but your health and safety is an important issue. Professional moving firms have proper equipment and they are properly trained in how to pack boxes and then lift them. There are basic steps involved with moving items and even watching the professionals for a period of time will indicate the right way to move items around the home. Research indicates that 3 out of 4 injuries that are caused by lifting manually can be prevented. When you are lifting and moving a lot of boxes and items, you will be increasing the number of times you run the risk of injuring yourself. Even if you do hire a removals firm to assist with the moving process, it is likely that you will want to help to ensure that the process runs as quickly as possible. There are some steps you should take to ensure that you are lifting properly when you are moving home. You will want to ensure you are standing directly in front of the box, parcel, package or item you are looking to life. You should always check to see if there are handles that can be utilised when lifting the item. Before you lift, you should know where you are taking the item and the general route you should take. There may be obstacles in the way that you haven’t thought of, so it pays to be vigilant when you are walking but having an understanding of your route before you start will help in the long run. You should ensure that your feet are positioned a shoulder width apart and that your back is straight. You should also be looking to stand up as straight as you possibly can. You can enhance your lifting position by tightening the muscles in your stomach and when you move to lift the box, you should not move the upper section of the body; you should look to squat to lower yourself to the floor. This can be achieved by bending your knees. Grasping the item with both hands and ensuring that the weight is distributed in an even manner and that you are balanced, straighten your legs and rise upwards. There is no need to move quickly, taking the process slowly is perfectly fine and you should now proceed to move forward with the item or box. While it is understandable that you will want to move through the process as quickly as possible, you shouldn’t rush yourself. It is okay to move in small steps as it is far better to lift and move properly than it is to rush through the process. When the time comes to lower the item you have moved, reversing the instructions will ensure you lift and move in a safe manner. There is a lot to be said for hiring a professional removals firm to take the strain of the moving process away from you but if you are lifting any amount of boxes, be sure to move effectively. Andrew Reilly is a freelance writer with a focus on news stories and consumer interest articles. He has been writing professionally for 8 years but has been writing for as long as he can care to remember. When Andrew isn't sat behind a laptop or researching a story, he will be found watching a gig or a game of football.